Silver Pendant featuring a classic spiral motif, typical of Ancient Greek and Minoan artifacts. It is part of the Neoclassic collection, a series of oxidized Sterling Silver jewelry featuring ancient Greek motifs with a modern flavor. 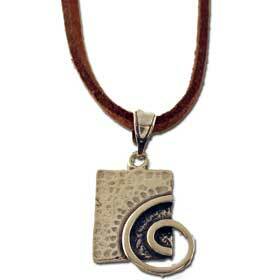 The rectangular pendant is complemented by a 20" inch leather cord (black or dark brown). The hammered rectangular pendant measures 17mm (0.67 inch) by 14mm (0.55 inch) excluding the pendant loop.